We all know that breakfast is perhaps the most important meal of the day, as a wholesome breakfast boosts metabolism, stabilizes blood sugar, and makes it easier to ward off cravings and eat more healthily the rest of the day. 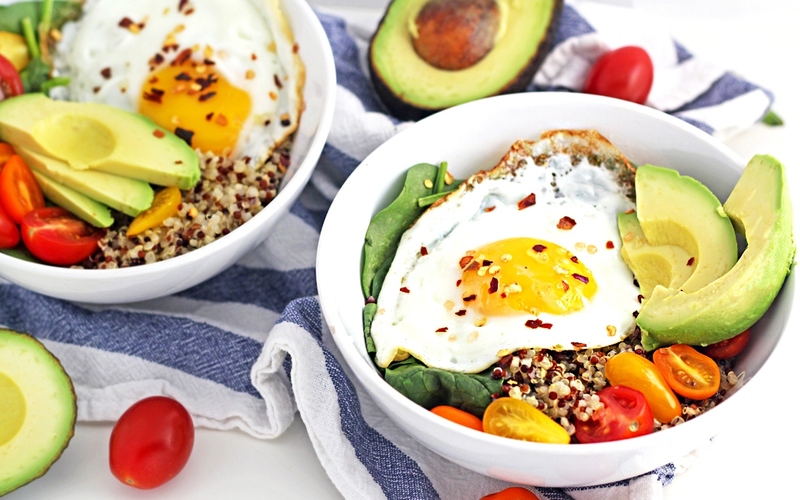 This gluten-free Quinoa Breakfast Bowl is a delicious way to start your day! Not only is it full of proteins and healthy fats that will keep you going until lunch, but it can be made the day before and reheated for a quick and ready-to-go breakfast! 1. Add the quinoa and water to a pot over high heat. Bring to a boil, then lower heat to a simmer. Cook for 15–20 minutes, or until quinoa is tender. Fluff with a fork and set aside. 2. Add coconut oil to a medium pan over medium heat. Crack the eggs directly into the pan and cover with a tight-fitting lid for about 2 minutes, or until the whites of the eggs are set. 3. Divide the spinach, tomatoes and avocado among four bowls. Add the cooked quinoa and top with the fried egg. Add sea salt and pepper to taste. Enjoy immediately or refrigerate leftovers.